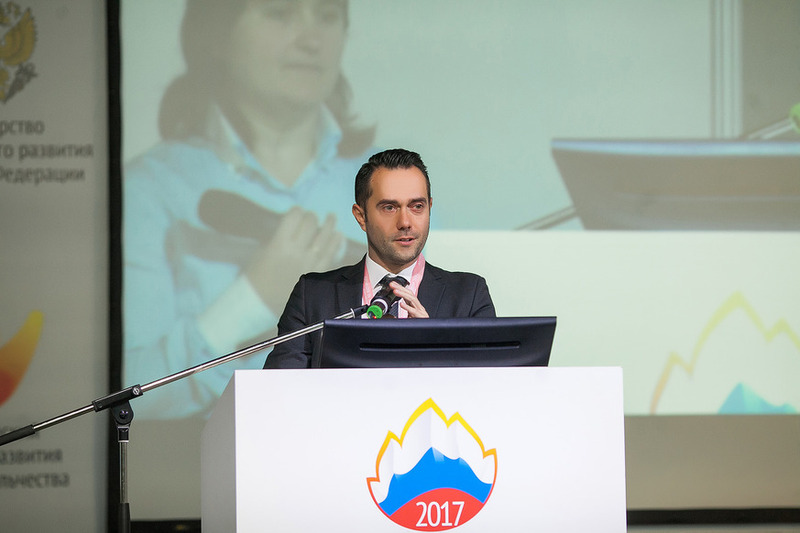 The largest event on volunteering and social innovations – the International forum «Volunteer of Russia 2017» took place on November 22-23, 2017 in Perm (Russia). Since 2012, the Forum has been an annual multi-component platform for exchanging experiences in implementing effective volunteer initiatives, strengthening cross-sector and inter-territorial cooperation of civil society institutions, developing long-term partnerships, positioning successful volunteer practices and social innovations. The event gathered representatives of the UN, leaders of volunteering sector, representatives of NGOs, volunteer-involving organizations, government officials, civil society, private sector and academia: more than 1300 participants and experts from 15 countries trying together to solve problems in the field of volunteerism and seek innovative approaches and ideas. Our Director and Executive Director of ARCO, Dr. Enrico Testi, participated as an invited speaker to give his contribution on social innovation and social entrepreneurship. The Program of the International forum «Volunteer of Russia 2017» was elaborated according to relevant areas of the 2030 Agenda for Sustainable Development adopted by the United Nations General Assembly in 2015. For the first time the Chef de Cabinet of the Director General of the United Nations Office at Geneva (UNOG) David A. Chikvaidze participated in the International event as an expert. During the Forum workshops, discussions, presentations, educational and foresight sessions were held. Enrico Testi was among the guest speakers on the first day at the workshop “Promoting business ideas in the social sphere”, where he gave a speech on how to build enabling ecosystems for social entrepreneurship and social innovations. He drew inspiration from the experience of the Social Business City Program created by the YSBCUF and implemented in Pistoia and Barcelona. The program worked on several target groups and local dimensions in order to facilitate the birth and the development of social businesses. The speech answers to an increasing need for exchange of experiences and concrete examples of successful implementations of programs and initiatives. Mr. Testi also took part in the plenary session “Volunteering: ideas, that change the world – Reports on the successful projects worldwide”,where he gave his contribution on “Social innovations and sustainable world development”. It was a great opportunity to confront with other great speakers and personalities such as Mehiedine El Chehimi, advisor and certified expert of the Arab Administrative Development Organization (ARADO) of the League of Arab States, CEO of the IM Trading Consulting Research (Lebanon), and Giulia Bordin, project and policy officer at the European Volunteer Centre within the framework of the European Solidarity Corps (Belgium). Our Director gave his last contribution in the foresight session “Developing social entrepreneurship” by sharing some examples and practical suggestions. Moreover, the «LAMPA» International film festival of socially oriented short films, videos and social advertising became a bright completion of the International forum «Volunteer of Russia» and took place on November 23, 2017. In 2017, more than 650 entries from 69 countries were submitted to the Selection Committee of the Festival. Short list of the «LAMPA» includes artworks of filmmakers from Spain, Turkey, India, Iran, Belarus, Mexico, Columbia, Philippine and Russia. He added “I believe that Perm, and Russia, are rapidly developing the third sector and as the Yunus Social Business Centre University of Florence we are very interested in being part of this process”. The Festival’s Organizers: the Perm Krai Government, Perm center for volunteerism development, National association for education development «Notebook of Friendship» in partnership with the Ministry of economic development of the Russian Federation and the Ministry of Foreign Affairs of the Russian Federation.